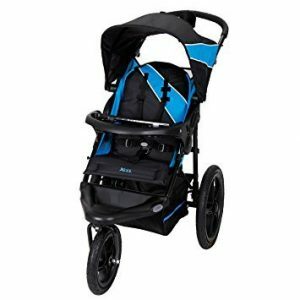 Baby Trend Strollers are an immensely popular brand in the USA. The USP of Baby Trend is that it offers highly innovative, practical, durable and feature loaded products at a reasonable price. Simply put, Baby Trend is like the Toyota of the stroller world – it does a damn good job without breaking the bank! We’ve put together the 12 best Baby Trend Strollers available in the US. We’ve also reviewed the Pros and Cons of each. This, along with the SNUGBABY SCORE should help you to pick the right Baby Trend stroller for your family. A top choice among jogging enthusiasts, the Falcon is smart, suave and sensible. The three wheel design along with bicycle tires ensures superb stability on all surfaces. The front swivel wheel allows it to turn on a dime. 10) Swing away child tray with cup holder, large storage basket plus parent tray with two cup holders. 1) Tires need to some basic maintenance. Air pump needed. 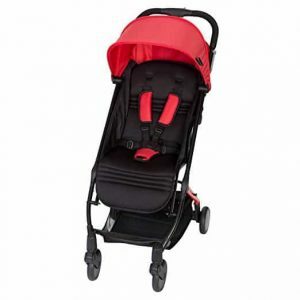 This lightweight stroller weighs just 13 pounds and looks especially cute in red! Don’t let the term ‘mini stroller’ fool you – despite it’s compact dimensions, the stroller can accept a child weighing up to 45 pounds. The Xcel is a best-selling JPMA certified jogging stroller. It’s equipped with large bicycle-like tires that effortlessly roll over virtually any terrain. 10) Lots of storage options: large basket, parent tray, child tray, cup holders. This 3-wheeled jogging stroller has a sleek, understated look. It has been manufactured using high quality fabrics and materials. This is a very efficient stroller as long as it is assembled as per the instructions in the manual. 9) Recommended for 6 months to 50 pounds. Max child height 42 inches. 1) Air pump needed for the tires. The Range is equally at home on sidewalks and trails. The hi-impact wheels are made up of a premium composite material. The front wheel swivels for low speed strolling or locks for better stability at higher speeds. 3) Padded seat reclines to several positions. 1) Air pump needed for inflating tires. This is one of the best, most sought after Baby Trend strollers in the USA. This particular set-up includes the Expedition stroller as well as the Baby Trend Flex-Loc 5-30 infant car seat along with the base. Together, these two form a very efficient, affordable and safe travel system. 2) Infant car seat usable up to 30 pounds. Max child height 30 inches. 3) True to the name ‘Expedition’, the stroller features all terrain tires. 12 inch front swivel-lock wheel and 16 inch rear wheels. Can go almost anywhere. 4) Car seat features EPS energy absorbing foam for side impact head protection. Base has push button height adjustment along with level indicator. 1) A few minor issues are reported but this is normal considering that thousands of models have been bought. Baby Trend has a very helpful after-sales department. 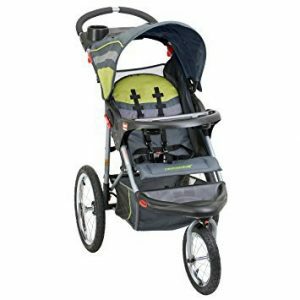 Thanks to its durable build and affordable price tag, the Expedition Double is among the top-selling double jogging strollers in the world. 4) Foot activated rear parking brake – very handy as the stroller weighs quite a bit when loaded to the brim. 3) Does not accept car seats. This travel system is made up of three components – the Expedition stroller, the Flex-Loc 5-30 Infant Car Seat and the car seat base. This combination is a hot favorite among parents as it features efficient products that work very well in conjunction with each other. 6) Wide Foam-padded handle, parent tray with covered storage and dual cup holders. The Ultra can accommodate two children weighing up to 50 pounds each. It has a bench and platform behind the main stroller seat for an older child to sit or stand on. 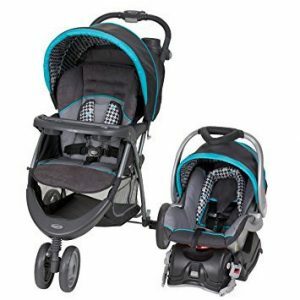 This double stroller setup suits a family with two children of slightly different ages – AND it was featured in our list of Cheap/Affordable Double Strollers! 1) Older child can walk ‘like an adult’ and hop on to the bench/platform if tired. 4) Several seating configurations. For example: Infant can be accommodated in a car seat fixed at the rear while older child sits in the main stroller seat at the front. 6) Storage basket, Sun protection hood, parent and child cup holders. 8) Folds and unfolds smoothly. Quite surprising considering the complex design. This travel system includes the EZ Ride Stroller and Flex-Loc infant car seat with base. Usable from day one up to 50 pounds. 1) The stroller has 4 wheels but the front to are set close to each other and function as one. 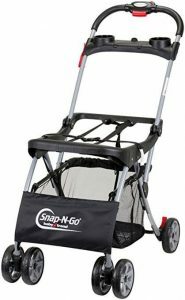 This lends added stability and makes the stroller easy to steer. Swivel locking feature for front wheels. 3) Multi-position seat recline with 5 point safety harness. 6) Height adjustable handlebar – this is a big plus! Can be used by parents of varying heights. 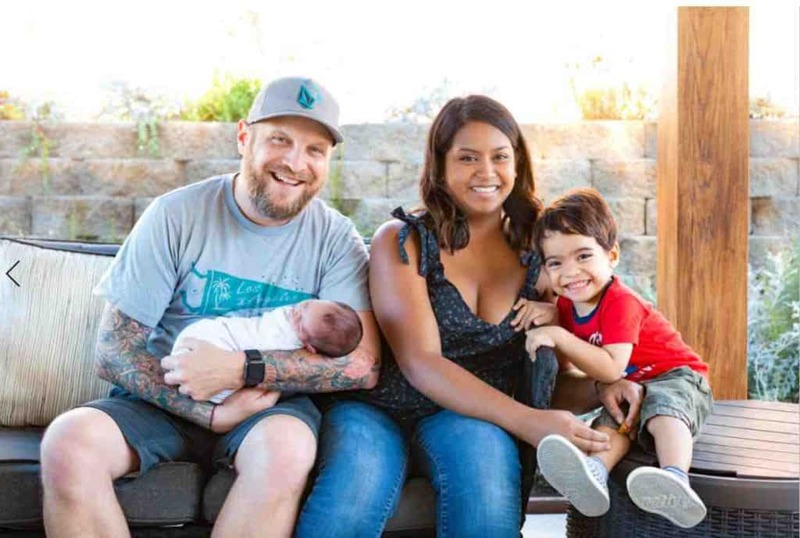 This is a great option for growing families. It accepts not one but two infant car seats (Baby Trend and other major brands). 1) Variety of seating configurations. Older child also has the option of standing or sitting on the rear bench and platform. 2) Removable rear seat – this converts the stroller into a conventional sit and stand. 6) Reclining seats with 5 point safety harnesses. 1) Ergonomics are not great in certain set-ups. This carrier is a great solution for strolling with infants. Just remove the infant car seat from the car and snap it onto the frame. Accepts most major brands such as Baby Trend, Graco, Peg Perego, Britax B-Safe, Evenflo, Maxi-Cosi and so on. 9) Best selling model with scores of rave reviews. Nothing. This is an awesome, lightweight and affordable carrier! EVERY stroller on this list is awesome, it really was hard to put them in a “1-10” type of order. Having said that, did you enjoy going through the 12 best Baby Trend Strollers in the USA?